"We do not consider just qualifying for the Champions League to be the chief ambition of the club, and with all our hearts we support the team and wish them well for the new season.Victory is absolutely not ruled out, but the current politics of the club's management will leave Arsene Wenger and his team with fewer and fewer opportunities in the long run..."
After the RVP debacle when he made public his letter to the board, there was much criticism of his timing, with many accusing him of opportunism but quite a number of fans agreed with what he had to say especially as regards "...the players themselves questioning their future at the club and the club's ambitions". At a time when even the hardest critics of the club's transfer dealings are impressed with its recent approach to the transfer market considering the acquisition of Podolski, Giroud, Cazorla and the pursuit of the likes of Sahin, Wanyama etc, one has to wonder about the timing of this new diatribe. I honestly don't support a man who owns the second largest shareholding in a business (29.9%) being frozen out of a seat on the board of the business but I can understand why. It is the natural order of things in the quest for wealth (in this case to get wealthier) that one plays the shark isnt't it? I am in no way qualified to offer advice to a man worth in the region of $18b but if I had the chance I'll tell him the words of the great Sun Tzu, "When the strike of the hawk breaks the body of its prey, it is because of timing." He's doing a really poor job of timing his criticism of the present management if he wants to win support for his cause and just continues to re-echo populist opinion like not considering "qualifying for the Champions League to be the chief ambition of the club" since the club has never come out to say so. There is a time to criticize the club (only constructively) we say we love and there is a time to lay down the gauntlet and support, support, and then support some more. This is a time to support this club we all love so much. Not our most ardent critics can deny that we've shown this summer that we intend to challenge for the title and not just play to qualify for the Champions League. The opening day of the season is barely 11 days away and our role as the 12th man when the boys line out against Sunderland will greatly be compromised if we allow the cracks that have been put in our ranks to widen further. It is a time to mend and support Arsenal FC with one voice. So please lay down your sword Mr. Usmanov. The news we've all been waiting for has come in the middle of my putting this piece together. 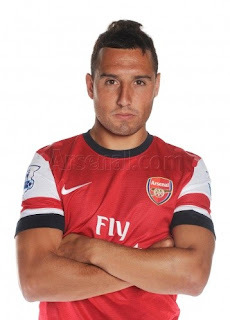 Cazorla has been officially unveiled as a Gooner. I had thought of a number of titles that will match the anxiety of waiting for this news and this was definitely not one of them. There were a number of news items that were planned for today's post but all pale in significance to the official announcement of Cazorla so we'll leave those for another day. Finally, I can go out this evening and raise a mug of beer in the air and shout "Cheers, you Gooners! Cazorla is a Gooner!